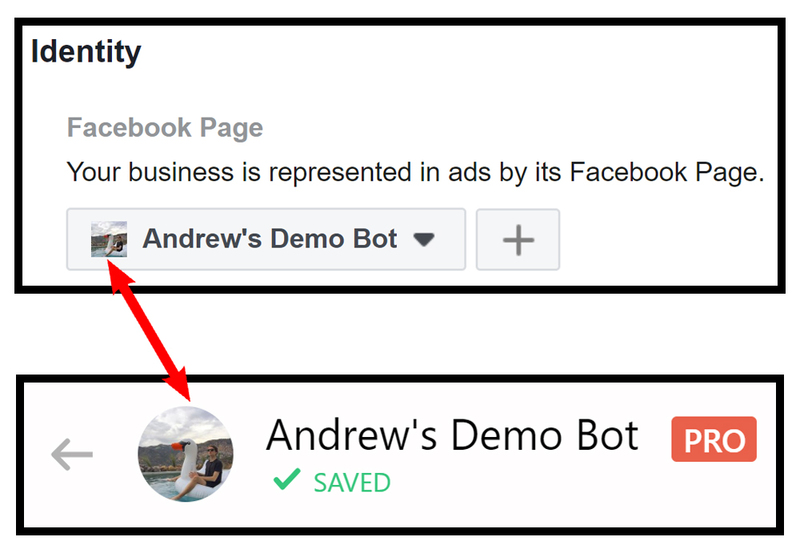 Allow your audience to start a Messenger conversation with your bot using a Facebook ad. Use a Messages Objective ad linking to a Messenger Destination. Use an Engagement Objective ad with Acquire Users from Comments. If you are on Pro you can also step-up your ad-game by creating a custom or lookalike audience based on your most valuable bot subscribers. The Messenger Destination ad is a special ad type by Facebook. 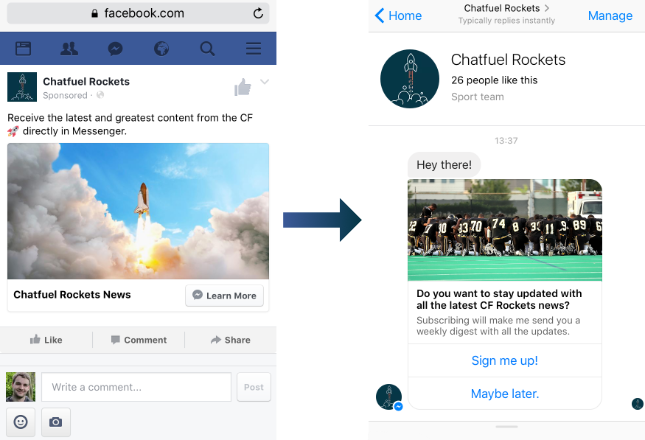 The ad will appear in the Facebook newsfeed (like a normal ad), but users who click the call-to-action button will be redirected to a Messenger conversation with the page. 1. Head to Facebook Ads Manager. Create a new campaign and choose Messages for the objective. Click Continue. 2. Leave Click to Messenger selected by default. 4. Select Edit Placements and de-select Instagram. While you can run Messenger ads on Instagram, it can result in poor user experience. Test it yourself, though! 5. Choose your budget and schedule. 7. Choose the ad's format, image, and content. 8. Under the Messenger Setup section at the very bottom of the page, select Custom Template then Get Started. 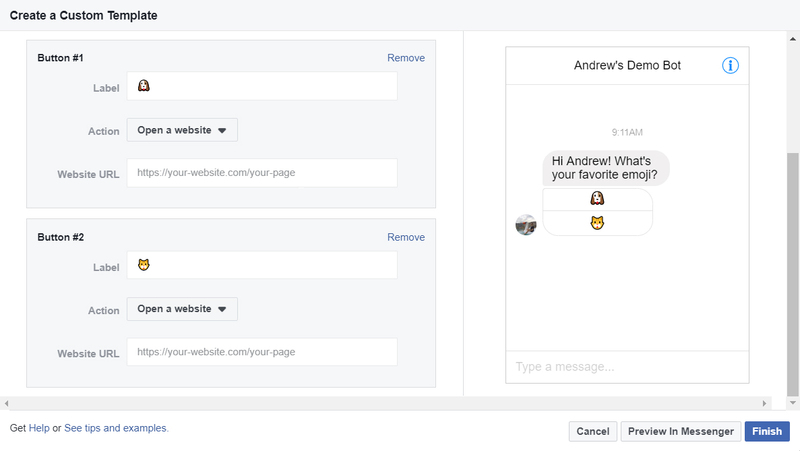 This will help us connect the basic welcome message (required by Facebook) to a more feature-rich block in Chatfuel. 10. Let's change the default buttons from Quick Replies to Buttons. 11. Finally, let's link each answer choice to a corresponding block in Chatfuel. This will provide us with greater flexibility. For example, we can segment users based on their choice and then subscribe them to a relevant 7-day nurture sequence. 12. Click the Preview in Messenger button at the bottom of your Custom Template setup window to ensure everything is working as expected! 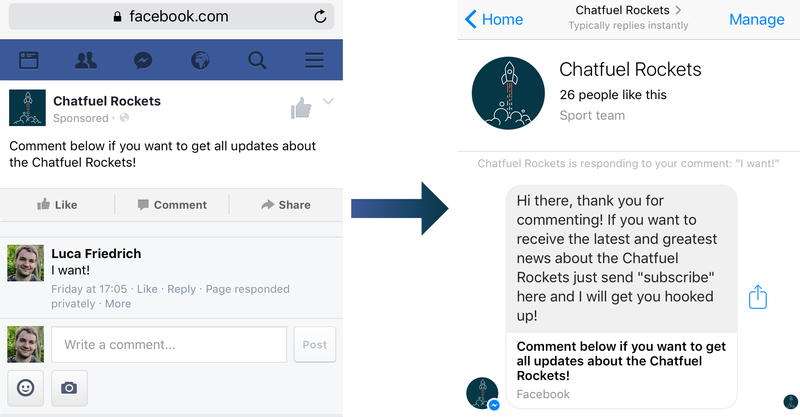 The Acquire Users from Comments feature turns users who comment on your Facebook posts into subscribers on Messenger. If a user comments below the ad, they will receive a message from your bot. 1. Publish a post as the Facebook Page your bot is linked to. 2. Set up Acquire users from comments for this Facebook post. 4. Choose an audience for your ad and set up the ad for the post of your page which is linked to Acquire users from comments. 5. If you're satisfied with the ad, place the order and get ready for new users!